Dungeon Runners Community Forums • View topic - DR in GW - What should our Cape look like? DR in GW - What should our Cape look like? Post subject: Re: DR in GW - What should our Cape look like? Sorry if things moved really fast but seeing as we had everything needed (payed for by Haem) and up running in the guild, I wanted to make sure we got a cape who showed people who we were too. I could always redo the cape if people isn't happy with it but it costs me 2,000 gold. Emblem - I went with the Flamingo, seeing as it is a quite funny and different design from what all the others use, but not to funny or weird. Shape - We just escaped the clutches of evil and came out of Dungeon Runners alive, so I made the cape ragged and torn in the bottom. Colors - It were really hard to make combinations who looked good. I tried brown/yellow combinations a lot (Dungeon Runners official colors) but it just didn't work. So a yellow emblem and red cloak with a dash of black in the bottom seemed to be the only one who looked nice. Future plans: When we have grown stronger in the future, the Refugees is no longer refugees and then we'll make us a cape who isn't torn and who glows of royalty and DR pride! I make just about everyone an Officer in the guild and all Officers can play around with the cape-making function at a Guild Emblemer so if anyone makes a flying pig cape (don't have to be pink), screenshot it and then it's just to put up for a vote here in our forums. That looks like fun, I might play with the cape maker function tonight. If I can put together something nice-looking, I post a screenshot. Except for my flying pig preference, the cape looks great, LM. I like the reasoning for your choices. 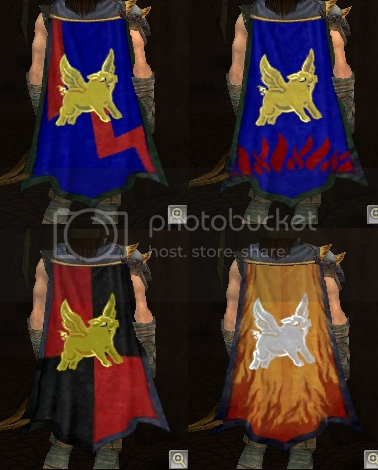 Maybe everyone who's interested should post a couple capes, then we can all vote on them when the time comes. Hahaha, I actually really like the one down to the left. Don't throw away that picture! When it's time to renew our cape I'm sure you'd get several votes for that one. I like the one with the pig and the lightning bolt! I think we need to have a flying pig on the cape. After all, we all know that will be the first sign in the heavens that NCSoft has made the decision to reinstate DR! I read it in the Book of Karl so it must be true.